1971 – Moving to the Space side of Geek, Apollo 14 astronaut Alan Shepard hits the first golf ball on the Moon. He used a six-iron attached to a sample collection tool. He hit 2 balls, in which the second would have made Happy Gillmore look bad. Of course, the moon has 1/6 the gravity as the Earth does. 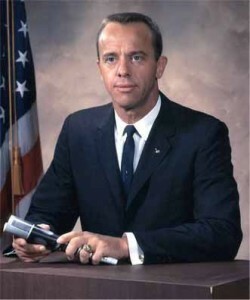 Alan B. Shepard Jr. was also the second person to travel in space and the fifth person to walk on the moon. His Apollo 14 piloting of the lander was deemed the most accurate. 1985 – Steve Wozniak decides to leave Apple. He remains a shareholder on the board. He will come back as an advisor when Gil Amelio takes the reigns. 2004 – Austrailian officials raid Kazaa on copyright infringement.